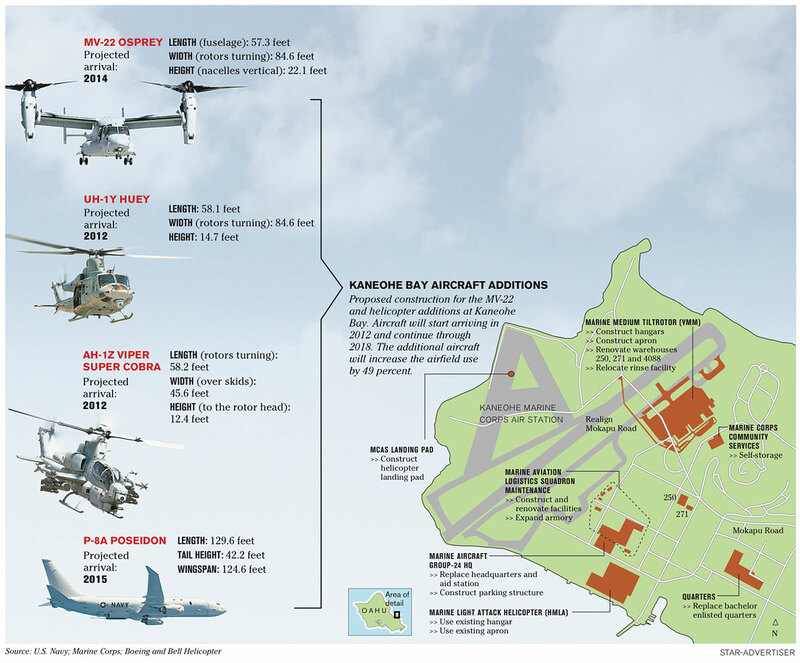 The Honolulu Star Advertiser reports that the proposed expansion of Marine Corps aviation activities in the Marine Corps Base Hawaii Kaneohe Bay will increase by 49%. Ko’olaupoko residents have an opportunity to speak out against this plan! A new Marine Corps study says airfield use at Kaneohe Bay is expected to increase 49 percent by 2018 compared with a 2009 “base-line” level of activity, as the Corps and Navy update aging aircraft and add new capability in a reflection of Hawaii’s growing importance in the Pacific. Plans call for basing 18 P-8A Poseidon submarine-hunting jets at Kaneohe Bay, 24 MV-22 tilt-rotor Ospreys, 18 AH-1 Cobra and later, Viper, attack helicopters, and nine UH-1 Huey transports. The 652-page draft environmental impact statement released by the Marines for the helicopters and Ospreys also points to a 200 percent increase in “transient” large jet operations by aircraft such as Air Force C-5 cargo carriers and Russian/Ukrainian An-124s, the world’s largest cargo airplane, as logistical needs grow. The increases would be offset by the retirement of two squadrons of about 24 aging CH-53D Sea Stallion helicopters (one squadron of CH-53E Super Stallions would remain) and the departure of most of the Navy’s propeller-driven P-3C Orion sub hunters. Plans for so many aircraft plying the skies near their neighborhoods have some Kaneohe residents worried even more about the noise that has been a constant and sometimes unwelcome companion along the emerald bay. Between 2012 and 2018 the helicopter and Osprey basing would bring about 1,000 active-duty personnel and 1,106 dependents to Kaneohe Bay, which had 9,872 Marines and dependents living on base in 2010, according to the study. The Marines’ preferred plan for the helicopter and Osprey basing is paired with $578 million in anticipated construction costs to demolish old barracks and build three new four-story buildings, construct two hangars and a new headquarters, renovate and expand existing facilities, and create an additional reinforced concrete landing pad at West Field over six to 10 years. The helicopters would be the first to start arriving, as soon as next fall, with five Cobras and four Hueys. The Marine Corps has prepared an draft environmental impact statement that is currently available for review and comments. Officials said in May the first P-8A Poseidons would come to Hawaii in 2015, and the basing plan has one squadron of 12 Ospreys showing up in 2014 and the second in 2015. The draft EIS, available at www.mcbh.usmc.mil/mv22h1eis, has a 45-day public comment period, and public meetings will be held on Oahu and Hawaii island from Nov. 30 to Dec. 8. The Osprey are a controversial and dangerous aircraft that has come under fire by Congress for cost overruns and accidents. The helicopter and Osprey basing is “part of the Marine Corps’ plan to restructure and rebase its forces in the Pacific over the next 10 years,” the report said. It seems that the plan to “restructure and rebase” U.S. forces in the Pacific are linked to growing opposition in Okinawa. The expansion would not only affect Kane’ohe. Training areas outside of Mokapu, such as Pohakuloa and even Kalaupapa on Molokai, will see increased activity under the proposed plan. Flight training would take place not only at Kaneohe Bay, but also at Bellows, Schofield Barracks East Range, Dillingham Airfield, Pohakuloa Training Area on Hawaii island and even at Kalaupapa Airfield and the inactive 12-acre Molokai Training Support Facility, which would be reactivated. According to the environmental study, there were 52,669 aircraft operations at Kaneohe Bay in 2009, including 5,449 landings and takeoffs by practicing Air Force C-17s, one of the biggest sources of jet noise complaints. By 2018 there are expected to be 78,725 flight operations. By comparison, in 2002 there were 90,000 airfield operations. Marine Corps officials said the increase was preceded by the closure of Barbers Point and movement of P-3 aircraft to Kaneohe Bay. Public Meetings Public meetings will be held to obtain comments on the EIS in accordance with the National Environmental Policy Act (NEPA) and to meet public involvement requirements pursuant to Section 106 of the National Historic Preservation Act (NHPA).